Fr. Gregory Mwageni, OSB, Celebrates 90 years of Age. A man of the people, Fr. Gregory Mwageni, OSB, was the first superior of the independent Hanga Abbey. He is the only living of the four pioneer monks of Hanga Abbey. His felow pioneer monks were Frater Bernard Monji, OSB, Frater Joseph Kinunda, OSB, and Frater Bonaventura Malibiche, OSB. This year 2012 Fr. Gregorey Mwageni celebrates 90 years of age. The 3rd of September 2012, on the feast of his patron saint Gregory the Great, was a day of special celebration at Hanga Abbey for his anniversary. The monks of Hanga Abbey owe Fr. Gregory a lot of thanks for his dedication to the abbey and the sound spiritual foundation he has laid for the monks as the first superior of the independent monastery since 1975. Fr. Gregory is also well loved and respected by villagers all around Hanga Abbey. Since when he was a superior to the present many people from near and far from Hanga Abbey come to Fr. Gregoryfor spiritual direction and counseling and advice. Hespends most of his time with people. He cares about people and works for the peoples well being. He is truly a man of the people. In the photos below one can notice that Fr. Gregory is always with people. 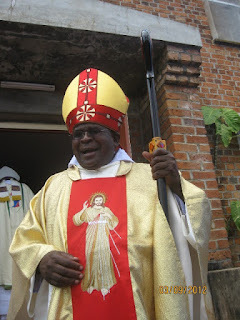 The former and first abbot of Hanga Abbey, retired in 2004, celebrated thanksgiving mass and reception at Hanga Abbey on 3rd September, 2012. Abbot Alcuin Nyirenda, OSB, was ordained a priest in June 1997 and headed Hanga abbey as an abbot from 1994 to 2004. A man of great ambition and vision with many talents, while he was a ruling abbot did much to improve the monastic office liturgy. He composed novel music for Compline and made new liturgy for the office of the dead. In terms of economy his legacy lives in the buildings in Songea town where the abbey has stores for business and renting. Not to forget abbot Alcuin pioneered the establishment of water bottling facility in Njombe mountains about 500km north of Hanga Abbey. We thank abbot Alcuin for his great contribution to the abbey of Hanga. We wish him many more years of blessings and service to God and His people. 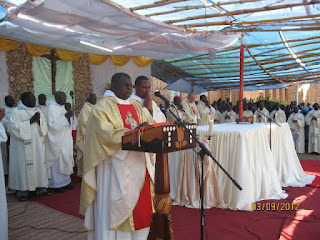 In the photo below Abbot Alcuin at mass as he celebrated his ordination jubilee.